The Hulk arrives in Madripoor. In Tahoe, Nevada, Mr. Fixit is tasked by a mob don to check on the recent setbacks of his partner in the Far East. 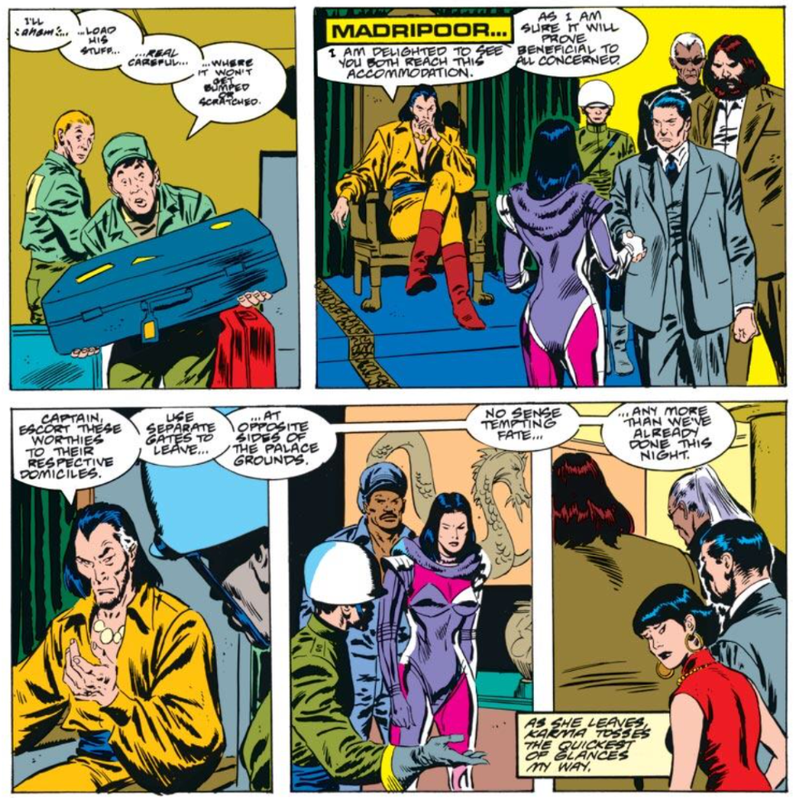 In Madripoor, the prince admonishes everyone present for fighting in his home, but when he spots Lindsay McCabe amongst them, he is delighted and declares everyone his guests, much to General Coy's consternation. En route to the airport, Mr. Fixit's car stops for gas and his driver is harrassed by a biker gang, prompting Fixit to fight them off. Back in Madripoor, Wolverine helps Tyger remove her protective armor, telling her the prince has agreed to allow both her and Coy to continue to operate, each focusing on their respective activities, a compromise that Wolverine believes to be good enough for now. In Los Angeles, Mr. Fixit boards a flight for Madripoor. At the prince's palace, the prince oversees the agreement between Tyger and Coy and shows them out, then reveals himself to be a fan of Lindsay's acting work, bringing her to a room filled with memorabilia from her movies before asking for her autograph. 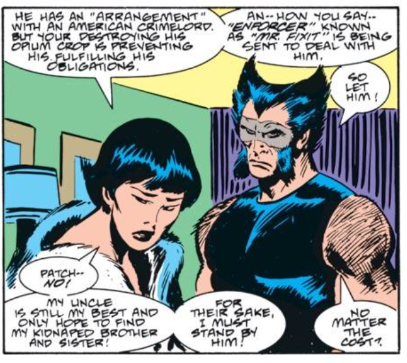 At the Sovereign Hotel, Wolverine meets with Karma, who asks him to protect her uncle from Mr. Fixit, as he is still her best hope to find her siblings. At the airport, Wolverine, recognizing Fixit, watches as he's attacked by a group of thugs, presumably sent by Coy. After Wolverine intervenes to save Fixit's driver, Fixit hires Wolverine to drive him to his hotel in place of his shaken up driver. Curious why Fixit was so insistent on arriving before dawn, Wolverine sneaks into his room after the sun rises and discovers a sleeping Bruce Banner. Wolverine laughs, thinking it's going to be fun making Fixit regret stepping foot in his town. This issue guest stars the Hulk, who at this point in this history is still a surlier, more sarcastic grey Hulk who comes out at night. He is currently working under the name Joe Fixit as a casino bouncer/enforcer in Las Vegas, and is sent to Madripoor as a favor to a mob boss who is a friend of his employer and who is owed money by General Coy (which Coy lost when Wolverine destroyed his opium supply in issue #5). It's also suggested that he drugs himself so that when he reverts to Banner's form during the day, Banner just sleeps until nightfall (I'm not sure if that's something from Hulk's series at this time, or an invention this issue of Claremont's). Wolverine-as-Patch battling the Mr. Fixit Hulk makes for a pretty great microcosm of Marvel in the late 80s/early 90s. The gang war between Tyger Tiger and General Coy comes to close this issue, as a stalemate is suggested by the prince in which Coy is given control over Madripoor's drug and slave rackets (two areas in which Tyger won't participate) while Tyger handles everything else, which will be the new Madripoorian status quo, at least for awhile. In the wake of the gang war's end, Karma continues to stand by her uncle, asking Wolverine to help protect him from Mr. Fix-It because Coy is still her best chance at locating her missing siblings. Much is made of Mr. Fix-It needing to get to his hotel by morning (before he turns into Banner), meaning the fight at the airport which closes this issue is taking place at night, yet the art in no way makes that clear, with the brightly colored (or just white) panel backgrounds used at various times creating a sensation that it's broad daylight during the fight. John Buscema inks himself this issue, giving the art even more of a classic, retro feel. Hulk appears in this issue following issue #354 of his series. It's revealed that Prince Baran (who is named this issue) is a Lindsay McCabe superfan, to the point of having mannequins decked out in outfits from her various film roles, and this is essentially what prevents the prince from executing (or trying to execute) Wolverine and his allies on the spot. 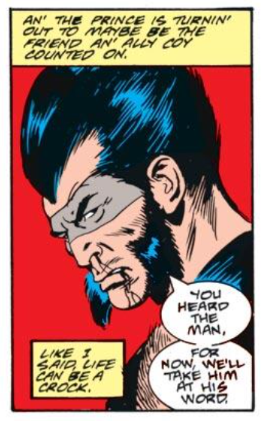 It's fairly clear in several places in this issue that Wolverine is indeed wearing a pseudo-mask over his eyes. The prince's chancellor, whose death kicked off this gang war storyline is issue #4, is confirmed to have been ordered by General Coy. 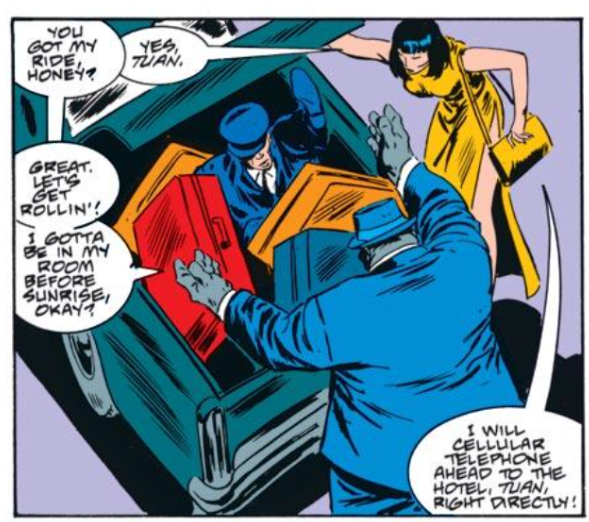 Mr. Fix-It's driver in Madripoor offers to call ahead to the hotel via a "cellular telephone". 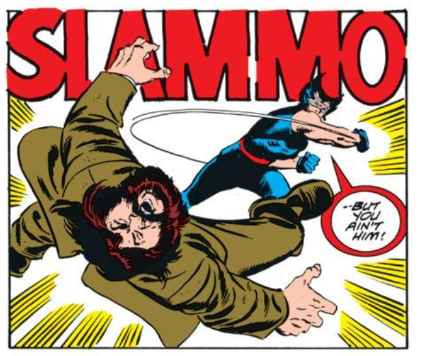 Wolverine punches out Roughouse with a mighty "slammo"! 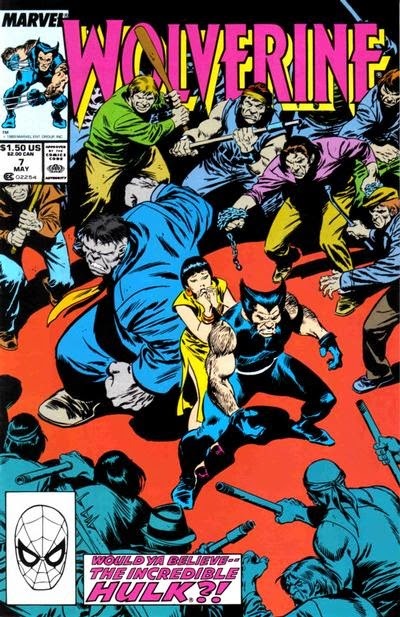 Following up on last issue's structurally-atypical ending, this issue brings the Tyger/Coy gang war story to an end in a similarly atypical manner, as Madripoor's prince simply declares the conflict over halfway through the issue as Wolverine convinces Tyger to accept, for the time being, a place as a kind of co-crimelord of Madripoor with Coy. In doing so, Claremont transitions into the next story arc (a confrontation with the Hulk) midway through this issue rather than between issues, and puts Wolverine in a position to be defending Coy only pages after he was about to slit his throat (though abrupt, this transition mostly works, and fits the more morally gray Wolverine of this series). That transition, and the ultimate resolution to the gang war, also makes it clear that it wasn't just the characters who were establishing a setting for the series, it was also the plot itself, as now we're left with the new, seemingly ongoing, status quo of Tyger and Coy vying for supremacy (and the Prince's favor), with Wolverine caught in the middle. It's a non-traditional ending for what, until the very end of last issue, was structured like a very traditional superhero adventure story, and it makes for effective world building for the young series, which is rarely a bad thing. 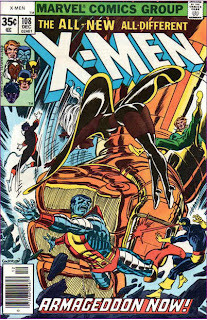 The X-Men battle an invasion in Uncanny X-Men #245, the New Mutants battle a sea monster in New Mutants #76, and X-Factor battles trolls in X-Factor #41. Is that Coy or Roughouse being punched by Patches McLogan? "as now we're left with the new, seemingly ongoing, status quo of Tyger and Coy vying for supremacy (and the Prince's favor), with Wolverine caught in the middle." Does Karma not know that Patch is Wolverine? "It's also suggested that he drugs himself so that when he reverts to Banner's form during the day, Banner just sleeps until nightfall (I'm not sure if that's something from Hulk's series at this time, or an invention this issue of Claremont's)." I don't recall drugs per se, but yes it was something that Peter David established in his run at the time. Basically, Grey Hulk would do a variety of things to ensure that Banner would be incapacitated/trapped the following day, so as not to work against him. @wwk5d: Is that Coy or Roughouse being punched by Patches McLogan? Technically, no. I know that at least some of these characters, like Jessica and Lindsay, eventually admit they know Patch is Wolverine and are playing along to humor it, but I don't know if Karma is in that group. @Spithead:Basically, Grey Hulk would do a variety of things to ensure that Banner would be incapacitated/trapped the following day, so as not to work against him. Makes sense. Thanks for the heads up. Teebore: Technically, no. I know that at least some of these characters, like Jessica and Lindsay, eventually admit they know Patch is Wolverine and are playing along to humor it, but I don't know if Karma is in that group. 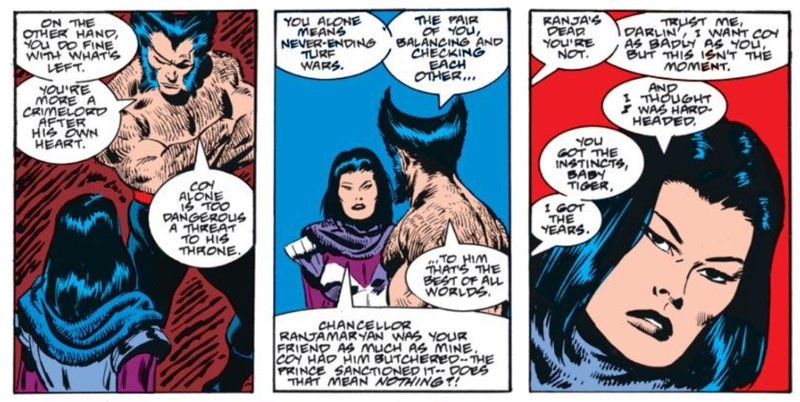 There's zero chance Shan not knowing he's Wolverine when they chat together like in that one panel there. She's been costume-freely adventuring with him several times... very much costume-freely in the Arthur Adams -drawn Annuals. It's hilarious how the pseudo-mask shows his both eyes. "My god, Patch, without your patch you look just like..." Maybe they all are just afraid of the possibility of a SNIKT ending such notions.
" I don't know if Karma is in that group." The letters page from around this time said that Karma DOES know, but oddly that was never made clear in the actual content of any issue. "Basically, Grey Hulk would do a variety of things to ensure that Banner would be incapacitated/trapped the following day, so as not to work against him." I pulled a muscle rolling my eyes at this. Lindsay's only in his castle after getting caught up in plots that stem from her coming to Madripoor by relative happenstance. She's one of the prince's favorite actresses? Fine. That's an acceptable plot twist. He's completely obsessed with Lindsay's checkered career to the point of having an entire room in his palace dedicated to statues of her in character? Please. Venom, Thunderstrike, and John Byrne's fourth-wall–breaking She-Hulk feel left out. Which actually makes less sense than a patch, because a mask explicitly says that he's trying to hide a face that might be recognized rather than wearing a disguise that isn't designed to advertise that it's a disguise. Not that the patch should really fool anyone unless he's wearing that fedora with it, as we've been saying for months. Maybe instead of a mask the smear is supposed to be some kind of greasepaint he wears in battle to reduce glare or just make himself look more badass? The whole "Patch" thing is stupid, much like the fact that no one tells X-Factor or Excalibur or the New Mutants that the X-Men are alive. Or that Cyclops abandoned his wife & child without a word. Or that X-Factor was posing as mutant hunters. While there was plenty of good material in the late-'80s, X-readers were asked to swallow a LOT of crap. Were they so out of ideas that they had to resort to such baffling over-arcing plots? Again, Claremont & Silvestri made a good team on an issue-by-issue basis, but the various creative teams had to stretch way too hard to make the uberplots fit. as a huge fan of PAD's Hulk, I'll have more to say about Mr. Fixit's guest appearance when Teebore gets to issue 8. @Jason: The letters page from around this time said that Karma DOES know, but oddly that was never made clear in the actual content of any issue. Good to know. The Marvel Unlimited versions leave out the letters pages (one of my bigger beefs with that service) and that portion of my physical collection is such a mess I can't as easily check the original issues for relevant letters. I didn't But NOW I did. (Or didn't I?). @Blam: He's completely obsessed with Lindsay's checkered career to the point of having an entire room in his palace dedicated to statues of her in character? Please. Yeah, that's the point where it goes too far. I think it's a case of someone wanting a more visually exciting way of showing that the Prince is fan beyond him saying "I'm a fan!" and asking for an autograph, but the end result is pretty eye-rollingly lame. @Blam: Maybe instead of a mask the smear is supposed to be some kind of greasepaint he wears in battle to reduce glare or just make himself look more badass? No matter what, this whole Patch business is clearly more trouble than its worth. @Mike: Were they so out of ideas that they had to resort to such baffling over-arcing plots? With the exception of Cyclops abandoning his wife and child, I don't think any of the plots are inherently bad, just poorly executed (and arguably, you maybe could get some mileage out of the Cyclops plot, if handled well). I mean, Wolverine needing to hide his identity to maintain the X-Men's secret is fine, and a nice nod to continuity (nowadays, in a similar situation no one would even pay lip service to the idea of Wolverine maintaining a disguise), it's just that it's carried out in such a haphazard and nonsensical way that it becomes too much of a distraction. In nowadays continuity they got Wolverine in every team and some of them - the ones in the other books - must necessarily be clones anyway. I guess the next thing will be team book The Wolverines where the team consists only of Wolverines picked up from different points in timeline. Byrne Wolverine and Jim Lee Wolverine don't get along too well with each other (a costume thing), Hulk #181 Wolverine don't get along with anyone but he's the best there is in the team in moving, and when it's time for the Fastball Special it's the adamantiumless bone claw Wolverine who gets thrown from his arms and legs by any other two Wolverines. Mind you, the cover of the first issue will be awesome. Alright, maaaaybe the X-Men faking their deaths is not a bad plot, but they kept having the team interact with friends. Suspension of disbelief on how they could keep up the ruse breaks for me at that point. Cyclops leaving his wife and kid might have been not-terrible if handled differently, but Scott can't come out of it looking good. Nobody who abandons their family to pursue an old flame can come out of it looking anything but awful. X-Factor as mutant hunters: horrible, awful plot. Terorize young people before saying you're the good guys? I can't see that ever working. I don't think it's a bad idea for Logan to have an alias for use in Madripoor per se — especially if a fair amount of people know that Logan is Wolverine and Wolverine is one of the X-Men and the X-Men are supposed to be dead, although the Patch identity is supposed to precede this period. Really the problem is just Logan as Patch interacting with friends, acquaintances, and adversaries who are supposed to not realize he's Logan as long as there's maybe a little something over one or both of his eyes and he doesn't pop his claws. Also the not-quite-costume of sleeveless blue tights with a red belt is dumb. So is calling himself Patch when he doesn't always wear a patch. So is using a patch as a would-be disguise in the first place when no matter how heightened one's senses are it's never a good idea to handicap one's stereoscopic vision. "Patch" in theory, however, I can see making sense. In-universe, it's not necessarily such a bad idea to set up a service where mutant haters/fearfuls can call and inform on a mutant, because potentially that is an easy way to get information on a potential young mutant who can't use his powers AND if he is potentially in danger by being targeted by mutant haters. Of course you ruin it by execution if you make "the mutant haters loosing their money" a selling point of the setup especially when you already have a multimillionnaire bankrolling your outfit, AND if you don't acknowledge, storytelling-wise, very early on why it could also be a bad idea (=show Hodge scheming already in the first issues). Claremont took IMO a nice catch of it by the mutant-youth-in-fear-of X-Factor-commits-suicide story in NM, but the early executors in the X-Factor book and later on Louise as the executrix insisted on playing it straight. Probably goes on the same ball drop where the majestic Jean Grey emerging from the cocoon in the John Byrne Fantastic Four issue who is nothing short of the Jean Grey who flew the damaged shuttle back to Earth suddenly transforms to be such a whiney creature on the X-Factor. @Teemu- there's several other problems- why don't they tell the other heroes BEFOREHAND to avoid a Misunderstanding Fight? Isn't kidnapping illegal in the Marvel Universe? why don't they tell the other heroes BEFOREHAND to avoid a Misunderstanding Fight? Proposing this sort of thing is blashemy, you know. Genre entertainment, genre conventions. Plus, where I come from back in the 80's the letter columns were full of questions: "Who would win in a fight, hero#1 or hero#2?" (more often than not, the heroes in question were Hulk and the Thing). It's a holy duty of the superhero comics publisher to every now and then give us an answer to such questions, and it would be an offense towards the readership to actively avoid such situation when one is (more or less) organically arising. @Teemu: I guess the next thing will be team book The Wolverines where the team consists only of Wolverines picked up from different points in timeline. They actually did that for a six issue or so arc in Exiles back in the day. IIRC the (pre-immolated) "Days of Future Past" Wolverine was their leader. @Mike: Alright, maaaaybe the X-Men faking their deaths is not a bad plot, but they kept having the team interact with friends. Yeah, that's a case of the execution letting down the idea. If you want the world to believe the X-Men dead, then they can't interact with other people who know them. Or, if you want them to interact with, say, X-Factor, while the rest of the world still thinks they're dead, fine, but you can't pick and choose which of their allies they let in on the secret. So if X-Factor knows, then the New Mutants and Excalibur need to know as well. Claremont seems to love the idea of the world thinking the X-Men are dead, yet the execution of it (admittedly, often brought on by the demands of the genre) is always problematic. The "World Tour" arc back during the Claremont/Byrne arc had similar issues with the suspension of disbelief (ie Banshee never calling Moira, even after he was injured). Cyclops leaving his wife and kid might have been not-terrible if handled differently, but Scott can't come out of it looking good. True, but there's nothing wrong with flinging a little mud on Cyclops' character. Just not turning him into the completely rephrensible jerk he was in early X-Factor. I mean, a story where he rushes off to see (and just see - no hanky panky) the resurrected Jean, realizes that she's still his past and Madelyne is his future, then returns to his wife and child and apologizes for his ill-thought immediate reaction doesn't have to be awful. Like Teemu said, the idea of X-Factor thinking "if people call us about mutants, we can get to them first and help them" isn't bad per se, the series just needed to establish that Hodge was manipulating them from the beginning, and shielding them from his anti-mutant ads so they don't look as much like chumps when everyone is like "hey, you're just making things worse!" It certainly wouldn't be perfect, but a story arc that's designed from the beginning to show X-Factor being duped into making human/mutant relations worse by convincing them being mutant hunters will get them access to mutants in trouble, only for them to eventually realize what's going and rebel against the idea much quicker than they did, wouldn't HAVE to be awful. @Blam: "Patch" in theory, however, I can see making sense. Definitely. Wolverine using a disguise makes sense, and frankly, if he didn't, we'd just be calling a different kind of shenanigans on these issues. It's just the actual execution of that disguise as presented that is problematic, for all the things you detailed and chiefly the fact that it's pretty crappy, as disguises go. @Teemu: but the early executors in the X-Factor book and later on Louise as the executrix insisted on playing it straight. Hey now, say what you will about Weezie, but she started dismantling the whole mutant hunter concept pretty much as quickly as she could. Making it all a ploy by Hodge who tricked X-Factor and showing the characters having misgivings about its effectiveness is something she starts laying the seeds of in her second issue, her first being devoted entirely to wrapping up the initial Apocalypse story. Teebore: They actually did that for a six issue or so arc in Exiles back in the day. IIRC the (pre-immolated) "Days of Future Past" Wolverine was their leader. You know... having the thought haunt me I actually was in disbelief why they haven't already. Should have guessed of course it's because they already have. Hey now, say what you will about Weezie, but she started dismantling the whole mutant hunter concept pretty much as quickly as she could. I stand corrected on that one... though her Jean still is pretty insufferable, especially when talking of Maddie, and Maddie was up to Inferno quite an important if gruesomely ignored building block in the X-Factor setup. I thought in the first issue Maddie's point of view was brought up very well, and then it all just... disappears? Like there was an editor or something who said: "Yeah, not that wife and family stuff anymore. Just optic blasts and Alliance of Evil." @Teemu: Like there was an editor or something who said: "Yeah, not that wife and family stuff anymore. Just optic blasts and Alliance of Evil." Pretty much, yeah. And yes, Weezie's work is certainly not without its faults (her Jean is largely insufferable more often than not), I just think she deserves credit for untangling the mutant hunter mess about as well as anyone could have. "True, but there's nothing wrong with flinging a little mud on Cyclops' character. Just not turning him into the completely rephrensible jerk he was in early X-Factor. I mean, a story where he rushes off to see (and just see - no hanky panky) the resurrected Jean, realizes that she's still his past and Madelyne is his future, then returns to his wife and child and apologizes for his ill-thought immediate reaction doesn't have to be awful." I always thought it would have worked out better if Scott took his two-week walk around New York, and during that time villains attack Maddie, and when Jean goes to help, both Maddie and Jean are injured. Scott runs to help as soon as he's back to normal and saves everyone but Maddie divorces him, and Jean is furious at him. That way, Scott just had a couple of weeks of weakness that turned into a disaster. Anonymous: I always thought it would have worked out better if -klip- Scott just had a couple of weeks of weakness that turned into a disaster. Of course, what we are ignoring here is that Marvel's great idea for the X-Factor was to bring back the original X-Men and that they would be awesome. Any weakness turning into disaster plot isn't going to fly with that premises at all. Of course, when one of the originals was dead at the time and another one, her then-boyfriend, married elsewhere to the spitten image of the dead one, pretty much nothing is. Of course no hanky-panky, if the official line is that no such thing had ever happened between Scott and true-Jean. We should probably be thankful that we were saved from Scott's on-panel horrid realization of it being an entity in command of vast intergalactic powers that he did on the butte, and it slowly turning into pseudo-patricidal smugness of "How do you like them apples, professor Xavier?"